My car is only 1 year old. Always trying to get very good take care of it and now this happens. too much development around and it was just one lane. Suddenly, I didn't notice but a deer passed just a few inches from my car. As soon as I saw that, I slowed down and two seconds later... another one but this time I couldn't do anything. I usually spot them so I try to be more careful, but this time I didn't see anything at all. The impact doesn't look very very bad, but the hood is damaged and it seems to have been displaced. I haven't tried to open it. 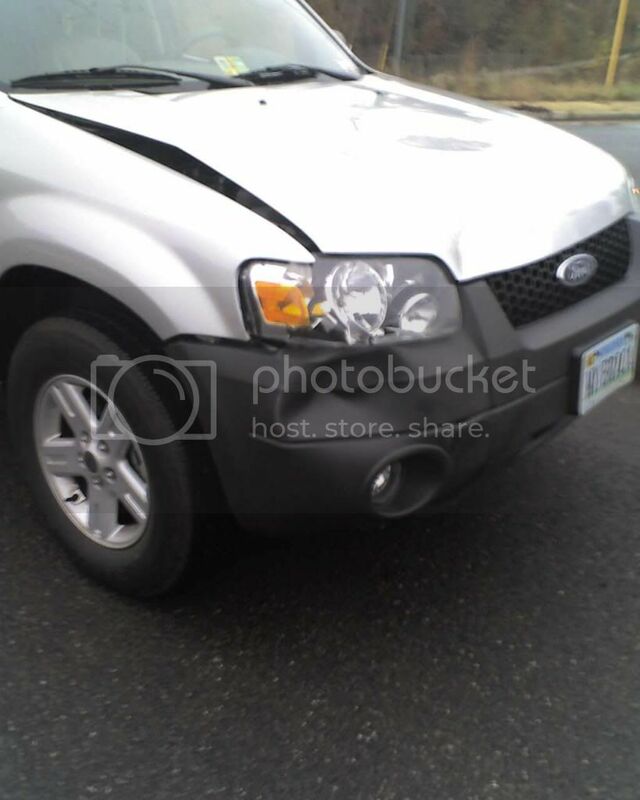 You can see in the last picture that even the bumper on the opposite side of the impact has been displaced too. My concern is that something has been pushed inside the engine compartment. Edited by LEM, 15 August 2014 - 10:05 AM. Sorry to hear about this. Looks like you got lucky. I know folks that have ended up with totaled cars and the animal in the windscreen. I'm glad you are ok. While it may look like you could have an issue with displaced engine compartment components, you will not know until an inspection is done. I would tell the insurance company it's only going to the dealer for inspection and repair. I almost had the same thing happen while riding a motorcycle. I had 2 deer pass in front of me 250 feet ahead. Then a third came out of the brush 50 feet from me. I had no time to stop. I got lucky the animal was moving fast and we did not connect. Shouldn't insurance cover it less the deductible? Edited by lolder, 15 August 2014 - 09:39 AM. I know what you mean about this, I hit a deer last year with my Flex and felt the same way. Don't be surprised if it comes out to be $4K to repair. I reported the claim yesterday, and I'm waiting for a representative to call me. I was going to ask them to take the car for repair at the dealership but I didn't know they could inspect it, too. I will do that. Thanks for the information. I remembered your post when I was going to post this... How the car has felt since it was repaired? Everything ok? Did you have any problems with the insurance for them to pay for everything? That's what I thought. I hope I don't have any problems with that. Sorry to see that, glad you are not injured. Here's hope of a speedy repair. Sorry to hear about your incident but I'm sure everything will turn out OK. I had accidents with way more damage including bend suspension parts and sub frame. Never had an issue after the repair but obviously the body shop has to know what they are doing. Yeah, that's my concern right now. I called my dealership but they don't have a collision center. They referred me to an independent body shop. I don't really want to bring the car there. Do you guys know about any Ford collision centers in Northern Virginia? Dang LEM sorry to hear about that, but you live only a few miles from my office, I see deer up there all the time. And acdii you got that right... here's the Escape Hybrid that had a deer try to jump the car and hit the front bumper and then land into the windshield (but didn't break it) -- just under $5k in repairs. Jerry's Ford has a collision repair center on Backlick Road Springfield. Never used them though. The headlight alone was nearly $1000 on the Flex, it was the HID one. They pretty much had to replace the right front of the car and repair the hood. It needed a bumper, right fender, entire grill, and underpinnings for the bumper. All that from a dumb animal that had already crossed the road once. Panel kinks are usually replaced these days. Hurts to see a wingman sidelined. Why don't these deer cross in their designated sign crossing areas? That's what the signs are for. So sorry to hear about your accident. Glad you weren't injured. I don't know about Virginia, but MN has a law that insurance must pay for the car to be repaired with OEM parts, no aftermarket parts allowed without written consent from the car owner, and a law that you can choose any body shop you want and that the insurance must negotiate the price with the body shop if you choose a shop that charges more than the insurance wants to pay. I hope VA has similar customer protection laws. We had our Focus Electric repaired at the body shop of a local dealer. They repair all makes/models but almost all of their work is on Fords since they're connected with the Ford dealer. They did an excellent job repairing our Focus Electric. Edited by hybridbear, 16 August 2014 - 08:44 AM. Sorry about your accident. When my wifes C-Max was hit from behind a couple of months ago I took it straight to the Ford dealers body shop for the $5000.00 worth of repairs required. The C-Max has driven fine ever since its return from the body shop. Sorry that you had to go through all that but I'm glad everything turned out ok in your case. I did a lot of research and I found one body shop that is also Ford certified. I got that recommended at my dealership and the yelp reviews are pretty good. I'm taking the car there on Tuesday. Do you know if your hood was replaced or fixed?